Hello all! I figured I’d post before I most likely lose power due to Hurricane Sandy. Today I am sharing a project that I actually finished quite awhile ago. I decided to tackle my first quilt this past spring. 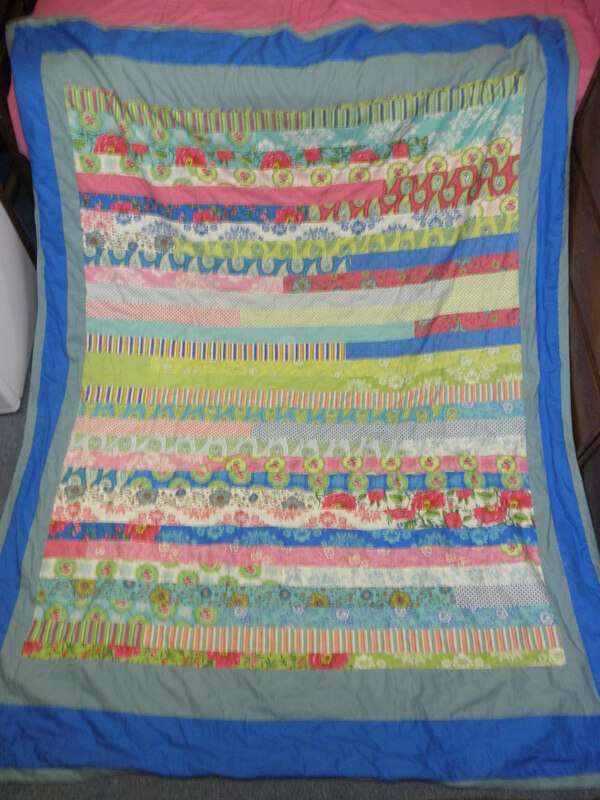 I took a quilting class at our local quilting shop, during which I created the base of the quilt (the stripes of fabrics). 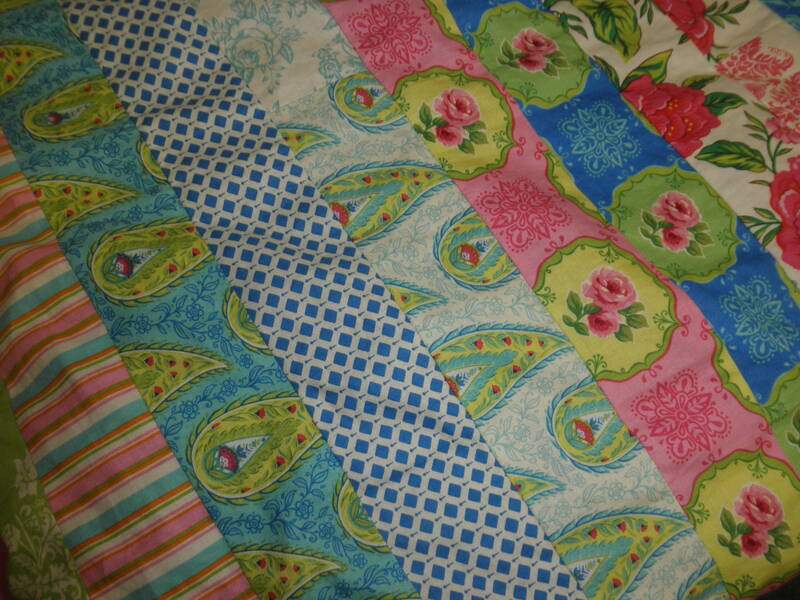 This quilt is a jelly roll quilt and was very easy to make. I then set it aside and didn’t work on it for a really long time. 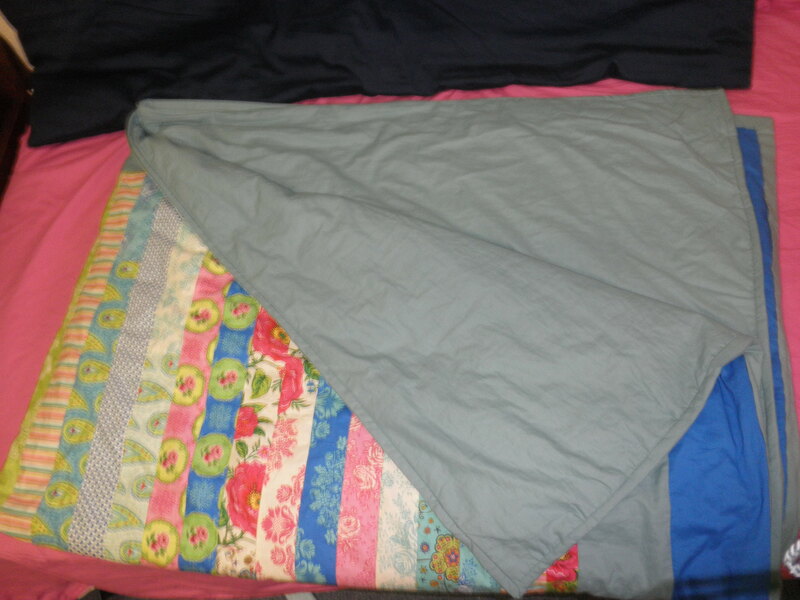 About two weeks before heading off to college, I finally purchased the additional fabric and batting to add borders, a backing, and put it all together. I used tutorials I found online to guide me. I didn’t actually quilt it. There are a few (about 6) pieces of embroidery thread that ties the layers together. I also did a zigzag stitch around the entire edge before adding the binding (it goes through the batting and all layers of fabric). I actually finished the binding on the car ride to college! I am really pleased with the results, but my pictures are of terrible quality (I’ve said this before, but my dorm room has terrible lighting and the camera I brought to school isn’t awesome in low-light situations). The colors are actually much brighter in real life. If I ever get better pictures, I’ll share it again. Enjoy your week and stay safe from the storm if you’re on the east coast! !